5 Easy Steps of Setting Up a Website Page-ranker! As we all know, Internet Marketing is one of the most important method of helping your website to get visibility on the search engines. Today we will look at “SEO Status Pagerank/Alexa Toolbar” as one of the best methods to help you monitor your website performance in terms of ranking in the search engines and also against other websites. I have done a brief instruction on how to install Alexa Toolbar on your Google Chrome Toolbar! 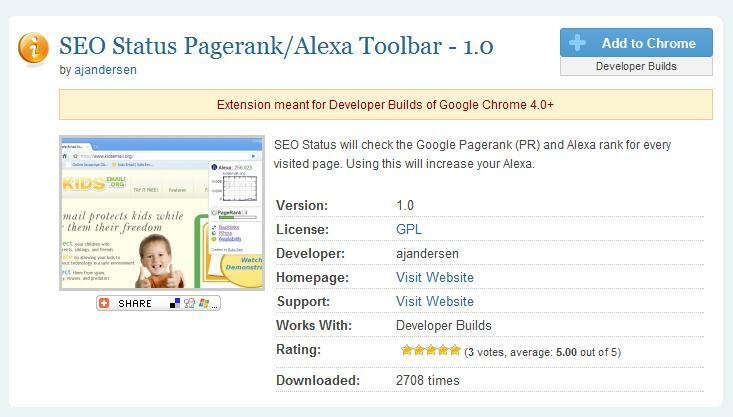 Go to SEO Status Pagerank/Alexa Toolbar. Once you are in the website, click on “Add to Chrome” in order to start downloading SEO Status Pagerank/Alexa Toolbar to your Google Chrome Toolbar. Once installed, you will be able to see a pop-up indicating where the SEO Status Pagerank/Alexa Toolbar will be located. Now you are ready to test any of your website to check how you rank in Google and also Alexa Toolbar. You just need to simply open your Google Chrome, then visit your website, and finally click on the SEO Status link found on the top right corner of your Google Chrome Browser. If you know any other useful page ranking websites then do let me know, I’ll include it in this post. You can also add it as an add-on on your mozilla. With mozilla you just ADD TO FIREFOX and it will integrate with your browser. Download it HERE. Thanks Martin for that useful information! I think that as much as we try to help websites rank higher on Search Engines, we should also encourage them to ensure their websites are good enough to reap the most from the traffic they attract. Otherwise SEO becomes a waste of time. Check out this article on why SEO isn’t the in thing anymore http://bit.ly/9eUA43. You do make a good point. But if you have a ‘good enough website’ without SEO then its going to be a bit harder to make it successful!